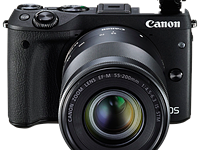 The Canon EOS M3 has been available in European and Asian markets for some time, but it's making its debut on US store shelves next month. The M3 is Canon's most serious mirrorless camera yet, offering a 24.2MP APS-C sensor, twin control dials, 3" tilting LCD and built-in Wi-Fi with NFC. Welcoming it to our shores, we took the M3 out during some of our last long days of summer. Take a look at our gallery and stay tuned for a few more high ISO samples. I am a "Real World" M3 user for a month now. Indoors, at the mall, at a carnival and other areas where colors are abbundant, the M3 gives me great punchy OOC. Just like my Oppo Smartphone but with tons better in the IQ dept. IS IQ Good? Yes, I use a 350D and sometimes the 60D but the image quality comes up same when imported into the laptop. All I know is I'm satisfied with the M3's output and I don't have to Lug-Around those heavier DSLRS in a hefty camera bag. And So Far....I have little need for anything but the kit lens on this. RAW and Adobe allows me to correct anything worth correcting. Don't be bogged down by some subjective shots here, make your own shots and decide. And If you can't afford this camera to begin with, or you simply are not vested into buying one, then hey....why bother trolling. it's not that bad. a bit buttery though. 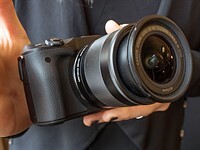 That review concluded "Its image quality is on par with the best of its peers and the camera is capable of creating beautiful photos"
It would therefore be surprising if the conclusion to the M3's review is dissimilar. The M3's weaknesses are not its IQ but its features, which lag its MILC peers. Its peers are only Canon cameras since cameras using other sensors are above it. I’m trying to compare the M3’s features compared to its peers. For peers, I’m trying to focus on cameras that are MILC’s, ASP-C sensors and within $200(+/-) from the M3. I’m using the MSRP price of $679 for the body (although it’s on sale for $100 off in the US right now). From that, I get limited to the a6000, a couple of Samsung's the Fuji X-T10 (there are other Fuji’s that could probably be peers but I don’t how much features change). Can’t shoot while charging, but you can charge it. Are there other things things that you would consider “features” that are missing? Are you using a other criteria to define a “peer” camera? I’m not comparing the usefulness of the features across the cameras as that is fairly subjective and will vary by user. I’m just focusing on the existence of features. It seems that what Dan is very kindly taking the heat for in this set of shots would actually be a matter of Adobe Photoshop/ACR, and how it is chosen to be used, along with the faults of a kit lens. - why on earth not use the lens correction, especially with a kit lens having lots of chromatic aberration, which blurs the shot? The camera does so correct, after all. Compare 45 and 46, the landscape with the blue-shirted guy low left. With ACR, white balance is much better than the camera does, trying to turn the land grey. But all detail is blurry - because ACR lens correction was not used. Blur on the guy, and you can see the color fringes on sky edges of landscape which caused it. - further, Adobe defaults to Adobe Standard as far as camera profile, which is really dull in appearance, compared to Camera Standard, which is probably what Canonauts are looking for. - last but hardly least, default sharpening on ACR is really low; at least for this camera, not enough. Take the 22mm shot Dan has kindly added, where you can already count the bricks and tiles on mid-distance buildings. Run a very standard sharpening on it, and all detail just jumps up, looks in fact really good. In review pictures as well as other ways, I like where the DPR team is leading. The use of ACR 'to taste' is tricky, but very valuable I think. With it we learn of DR limits to shadow pulling, for example, as Dan's art shots do here. In fact a little less 'didn't fiddle with geometrics' kind of self-limitation would I think be healthy, as above. We are after all interested in what the camera can do, in shots we might also take. So when using tools, use them, light hand should work ;). Canon has proven it again that mirrorless is crap. People If you want good quality images get a real camera DSLR. Right! Get the D7200, and you have much better camera than any mirrorless will be in 10 years. Sure. Right, it's because good image quality comes from the all-important reflex mirror (you know, that mirror that has to flip out of the way in order to capture an image)! LOL, not. I just sold my M3, EVF, 11-22, hood & adapter purchased through Amazon Japan last Spring. IQ was actually okay. I simply couldn't hold that tiny bastid in my big clumsy man hands without accidentally pressing buttons that changed settings willy nilly. Here are some additional photos from the M3 using mostly the EF-M lenses (and the nifty 50 for some). Not sure if this helps or hurts the case, but I feel like it has been producing some pretty good results for me. It's really odd that almost all pictures are with the kit lens or UWA zoom. The only pictures taken with a prime lens (the 22mm F2.0) are at 3200 ISO and above. Please post a few picts with the 22mm under normal conditions at reasonable ISO. That lens is really popular with the EOS-M crowd, and shots with it would be most helpful for folks considering upgrading. And while you are at it throw in a few picts with decent EF or EF-S canon glass using the adapter? I don't think the m3 is an upgrade. There are better options if you are not invested in Canon glass. This camera is a compromise the only thing that is selling these things is the Canon compatibility. LoL. Sorry but you made me laugh as I almost put "upgrade" in quotes but wanted the post to be constructive and not tinder for the ongoing anti-M flamewar. Since two weeks or so my M3 pics can also be raw processed in DXO10pro. With the 5D3 presetting applied it seamlessly fits into mixed productions with my 5d3 and 7D2. Love it also for the 11-22 which is clued on the m3 (only the 100mm IS macro replaces it from time to time!). Had all three cams on a Svabard trip the last weeks and could not be satisfied more. Well, I love my TWO EOS-M's and have played with an M3 but even as a Canon fan I cannot see the M3 being a breakthrough camera with the likes of Olympus, Sony and Panasonic in the way. Ah well, I don't think Canon has gone mad with massive production this time around so I doubt that the M3 will become REALLY cheap like the older M did. Shame. Fine if you like slushy noisy soft images with ropey colour. Argh! I really want to like this camera, it would be perfect for real estate stuff with the 11-22mm, but I use the shadow slider prodigiously and I'm not encouraged by the RAW examples given. There is nothing wrong with the camera, as in most cases I prefer OOC jpegs compared to the RAW output ones. There is something wrong wit the taste of the "post processor". At least compared to my taste. I am also a Nikon guy with different preferences (and color gamut). Isnt it great how DPReview only bother with this camera because the USA are getting it. Didnt matter that Europe already had it, so much for a world wide community on here. Whats the point of posting poor real world samples (see, the word "world" is used but apparently this doesn't mean there is life outside of the USA). There are loads of images posted all over the net by real photographers already. Your assumptions are entirely incorrect. Availability of reviewable products is often limited to the market it is released in. I understand your reply Dan but I agree with Dave. Since DPR has a large non-US audience and amazon does sell outside of the US, I think DPR should try harder. Hey, ask your overlords in amazon HQ for a bigger travel budget! Sometimes there are deals on Seattle-Heathrow flights. Amazon even sells gray market products so you can get gray market cameras before they are sold in the U.S. and even if they are never sold in the US, DPR should review them especially from a major company like Canon. Thank you dpreview for taking care of my GAS! Along my 5dIII I have the M and the M2. Even compared with OOC jpeg these here look truly lomo like. No idea what happened there, but if I was Canon I would be seriously pi**ed at you guys! No I idea how many people hit your page daily, but I guess you can hardly repair the damage you did. I tried them all and liked the EOS M3 for it's build quality but not for it's extreme slowness. And now I've had a good look at the pictures I'm glad I went for the bottom of the range Fuji which has amazing IQ and is much lighter - not to mention cheaper - than the Canon. This is very poor decision to build yours opinion on DPReview sloppy and misleading gallery. Using the M3 for 3 months now. Other camera is a 5d3. Love the M3, for its excellent photo quality. When people complain about RAW quality, we are talking about Adobe rendering, not about Canon. Out out camera jpgs are perfectly usable, just use the neutral picture style with increased contrast, sharpness and saturation as a default setting. Same for Lightroom, for best results make an import preset with camera neutral profile in the calibration tab, avoiding the adobe colors. The M3 with 22mm is a great aps-c compact for everyday use, that can be carried on your belt in a lowepro case. I am a Sony A6000 shooter & will be really honest. This is quite stunningly bad image quality here. The A6000 with the 16-50 PZ kit lens can perform better. I am inclined to believe that this has something to do with a bad lens? Especially considering that most folks who flock to the EOS-M system, do it for their Lens Quality alone. There is not much else to be offered by this system (Which competitors don't offer) apart from Sharp, Competitively Priced Lenses. I hate posts like this, you start by making a quite ridiculously overstated claim that the image quality is not just bad but "Stunningly" bad.. really !? picking on something you say is a strong point that "folks flock to" and saying it's "something to do with" that. Why are they bad? you dont even tell us its just an unqualified statement. where is ther reasoning? stunningly bad... Why ? explain. These look pretty good to me sharp, good contrast and colour, especially considering this is a kit lens. Hysterical. I could vomit into a shot glass, seal it with cling wrap and use it as a lens, and get better results than the Sony 16-50 PZ. Canon is not even capable of making a lens that bad. A camera is a tool, and that’s what we want it to be. You must learn how to use a tool. If you want sharper jpegs, why don’t you change the default setting in the camera? The M3 is also a very small and light camera, more prone to shutter and handling shake than a heavy DSLR. I never use ACR or Photoshop for anything but restitution, because I don’t like the output. To me, there’s no evidence in these ACR corrected sample shots. I process Canon raw in DDP and finish jpegs in NX2 – not a perfect work flow, but for me the best available. I find both the 11-22 and 18-55 to be excellent lenses, and the IS is needed in most cases. The 22 mm lens have no IS, and must be used with much more care than the others. Let us thank the wonderful staff of DPR for pointing out that this camera sorely needs to shoot RAW and will exact from your patience a lot of blood, sweat and tears of painful post processing before you can say the image is remotely presentable. Thank you also for the before-and-after, side-by -side shots showing the "out of camera JPEGs" and the "processed from RAW" final image. You can really count on the this new Canon to make it harder than ever for anyone to get any decent out-of-camera JPEGs. The great virtue of this camera is that it will teach you patience, long-suffering, and post processing Zumba. Photos can be quite noisy and smudgy, even at ISO 100. Either one of two things happened here . . . something is either wrong with how these images were taken/processed -OR- this camera produces some of the worst images I've seen in a very long time. theres several posters here telling us these are bad.. maybe its your monitor ? why are these bad ? Mostly a complete lack of detail. The images are not only soft, the actual detail level is very low. I am not biased towards other makes. I really like Canon in fact. But these images are very bad in terms of detail. I haven't checked the RAW files however. It is like the sensor is not really 24MP. you are clearly seeing something I'm not. I viewed these on a 27" 4K calibrated monitor and they look OK to me. The jpegs definitely look poor but details look perfectly fine to me, especially when you consider this is a kit lens. Ive seen much worse samples than this, The recent Fuji ones spring to mind. Id say these were average at worst. We are many, many years down the path of digital imaging science and a camera like this M3 should be able to produce awesome jpgs without human intervention—RAW should be a distant memory by now. So why does DPReview shoot in RAW? Why the necessity of all this post processing? Shouldn't part of the money we pay for a camera go to better image processing? It is time for the camera makers to step up their game and give us photos that are gorgeous straight from the camera so we don't have to waste hours fixing their shortcomings in post. I like stuff that's easy, too. But I don't know about "no human intervention." We already have more "professional" photographers than there are people. Why? Well, the camera determines the exposure, does the focusing, processes the image optimally and gives instant feedback if you somehow manage to make a mistake. Of course DPR readers still won't be happy but it's getting to the point where if the subject looks nice, so little skill is needed, it hardly pays to even show up. I'm exaggerating. A little. But compared to the time, knowledge and effort it took for an amateur to properly expose & process film and make high quality prints, honestly, how much easier can it get? Pretty soon, they will make cameras that analyze the subject and determine the composition--or let you listen to music or make phone calls while you decide where you want to point the camera. Spoken like a true smartphone photographer. Post processing is a creative process. A camera can have no JPEG output at all for all I care. Most cameras already produce very good JPEGs. But some people want more control of their images. After all, a camera can't read your mind and can't process an image exactly as you would have liked it. RAW basicaly allows you to do that: process an image exactly as you would like it. Even with how far we've come in automatic image recognition and processing, a camera can or should not decide for you what style you actually want a picture. Dpreview tweaked the photos according to their taste, gave them a slightly sunny yellowish look and more contrast. Canons automatic always goes a rather neutral approach, maybe because they know that people who buy these cameras actually know how to tweak the photos to their taste. IMO Canon goes the right way with this. jpg strips information from the image, why would anyone want to shoot it? One of the biggest appeals of EOS M system is ability to take EF and EF-S lenses. Sadly, the gallery is not showing the true potential of IQ that M3 can produce using L lenses. The amendment to the gallery in that respect would be appreciated. 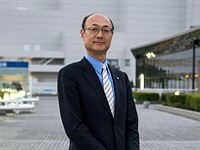 Is that really the "biggest appeal" of the EOS M system? To use lenses that aren't part of the EOS M system? I would think that the appeal of a system should be the actual system itself. Besides, EF and EF-S lenses are increasingly becoming capable of being used on other non-Canon camera bodies, such as Sony and Oly bodies, with full compatibility using the latest generation of smart adapters. So if using EF and EF-S lenses it the "biggest appeal" of the EOS M system, then I would say the EOS M system is in trouble! I'm hoping the next generation of Sony mirrorless bodies will inherit the A7R II's IBIS system and its high level of Canon lens AF performance so that I can use my L lenses on them! Then you wouldn't need EOS M, especially if you were mainly buying the EOS M so that you could use L lenses. If you want to utilize the true potential of your L Lenses, use a Canon 5Dsr or Sony A7rII. Yes well and if you got a Canon DSLR and an M3 now you would not need a Sony or Olympus to do whatever with the lenses in a year or two. I like the 11-22 and the 22 and adapted the 40/50/85 lenses. That is about all I use on my M. Comparing my 11-22, 22, 50 setup it is about 1/5th the price of my Fuji 10-24, 23, 56 and about 1/3 of the weight. Sure, the Fuji stuff is a bit more capable but well the Canon stuff is what I pack when size matters. And when reliability and image quality matters I pack my DSLR. Poor Fuji! Who seriously uses a $1000 lens on a $600 compact camera? This takes all advantages of the M system ad absurdum. Well, as much as one might encourage purchasers to explore the full range of compatible lenses, Canon would do well to deliver a more compact kit lens than what they're apparently pitching here. The 18-55 is a fair amount bigger than the 14-42 kit lens I got with my E-M5, and Olympus is bundling the EZ version in the E-M10 mark 2 kit, which is considerably smaller still. Neither of those cameras are aiming to be particularly compact, either, but they still deliver a viewfinder. The positioning of the EOS-M models is just incoherent, really. Is it supposed to deliver a superior compact experience or be an emergency backup body for DSLR users? Or neither? Or both? 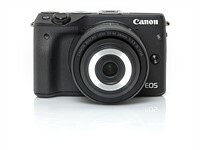 I'm going to order my Canon EOS M3 Today! Order a new pair of glasses at the same time . . . and hope the glasses come in before the camera does! The girl against the wall looks OK. ISO 640, not ISO100, and it's a jpeg. Is ISO 100 the default now? My old Rebel requires ISO 200 for lowest noise, which I prefer - faster shutter speeds. No, third time is not a charm for Canon. Good progress nevertheless. I liked this little bugger despite being uncomfortably small with quirky menus. It does very good job with the 22mm lens in good light, excellent colors, good resolution, not that great AF. The kit and telephoto zooms aren't anything to write home about. But then Sony does even worse. The drawback of the Canon sensors (and this one is no exception) is the noticeably worse high ISO noise and dynamic range compared to its peers. The OOC jpegs are also too mushy for landscapes, but the RAW file have all the resolution necessary. When Canon drops the body price to about $400 the camera will be able to compete with other similar cameras. But at this time it's just overpriced and competition presents better value. I think the original M does better than this, if this is representative at all of this camera. Remember....Canon likes to milk the consumer with little grades hoping every buyer has at least 4 camera bodies within 3 years. Convincing the consumer their upgrades were needed. That is doesn't have an EVF is mind boggling. Well, it has an add-on EVF, which is pretty cheap and decent. I though practically never used EVF. These cameras with a touch screen are more fun to shoot using LCD. @forpetessake - the add-on EVF is $231. I don't know if I'd call that "pretty cheap". That's an additional 40% more money on top of the cost of the base body. @ T3 : Good point mentionning the cost of a viewfinder. Because I don't like them (it's like looking through a keyhole), and I don't want to pay 250$ for a piece of hardware that is useless to me. That's why an external viewfinder is the way to go. I'm tired of people constantly commenting about the lack of built-in viewfinders. It happens that if you look around you, 90% of people taking pictures use the LCD (including some DSLR user !!). So stop trying to shove your expensive old useless technology to everyone ! It's still a half-a-- effort at a mirror-less. Carefully making sure it doesn't threaten DSLR sales, just like Nikon. Canon does not understand the formula yet. The following will have my attention: MILC + IBIS + APS-C + Built in EVF + Tilted screen + Two control dials + Fast cheap light primes with circular apertures. About the tilted screen. I never much liked it (on Olympus) because it was a bit stiff to unfold and didn't have the articulation ability of the (now) fully articulated screen. Or, the reversibility of the fully-articulating screens which work to protect your LCD at certain times. I would blame the regional server you're pulling from for the softness—you're probably not getting the full rez versions. I'm in the midwest looking at them on my 5k iMac and the ones that don't have motion blur are tack sharp. Nice gradation in skin tones as well. Same here, tack sharp! I'm in the Northeast. "I would blame the regional server you're pulling from for the softness—you're probably not getting the full rez versions." It's not 1995 anymore. I'm downloading the full files, and I wouldn't call them sharp. You need to process RAW files to get the best resolution. Jpegs smear details a lot even if you set the max sharpening in menu. These are the worst pictures I've seen from any MILC ever from any company, even worse than m4/3. They are extremely soft, even if they are JPEG's, there should be SOME detail in them. Just look any ANY pictures with tree leaves in them. Even a Canon G15 P&S can take better pictures than this. Canon should be ashamed of themselves for trying to sell a camera like this, for any price. It seems like they are not serious about getting into the MILC market IMO. 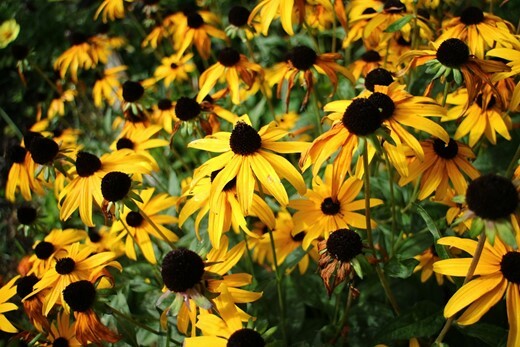 I own an old Olympus ZX-2 I picked up for half the price that takes better/sharper pictures than this. My old Sony 5T really puts it to shame. the jpgs are ACR converted weirdly. And is ISO 100 the normal ISO now, not ISO 200? Stop trying to make excuses for an extremely over prices POS camera that takes extremely soft images. There are quite a few out-of-camera JPEGs in there as well. The new lens mount from Canon... the "Ho-Hum" or just H.
We're these taken by Ken Rockwell? I don't know anyone else who would use a camera like this and test it's quality by shooting jpegs. saturation is too low for KR..
@AbrasiveReducer Half of the photo are raw conversions with the adjustments mentioned, and many of the JPEGs accompany the raw conversions for the sake of comparison. As such, I'm not sure what it is you are complaining about. - images converted by ACR, look pretty bad. did the reviewer move the sharpness slider down from ACR default of 25? I load them up without touching a slider and they .. look better. why are none of the ones that are "tweaked" include the raw files? - EXIF or whatever you are using for determine lens is messed up. #6 is nice, raw please. #9 isn't bad .. raw please. CR = 0, LNR >0 .. is weird. I think the ONLY lens used was the 18-55? actually used the 11-22 and the 22mm would be cool. I'm not sure how "real world these are" .. there's a TON of things wrong with the M3, it's a crappy release from Canon - and even with that, it can shoot miles better than this. No, the sharpness slider was not pulled down in any of the edits. Raw files have been added for the first few tweaked images, thanks for the suggestion. "Edited to taste" means just that. You clearly have different taste. I rearranged the photos so I have no idea what these numbers mean. Again, the use of NR is up to the photographer's discretion. I can not speak for Barney, but I mainly used it on higher ISO images. There are are a bunch we added to the gallery shot with the 11-22mm and 22mm. Take another look through if you have the chance. images from fuji look better. these are dull imho. The green tint in the borders is too much visible. The colors are too much like that other brand. Indeed, the green tint can be seen in several pictures, esp. in blue sky pictures, and is really ugly to look at. People seem to forget that only a few good photos gets taken out of a hundred. The journalist has one day with the camera, so do the math. It does look like these were taken without the view finder - that willl make composition harder in some cases. the thing as a tilted screen, if you can't take a picture without a viewfinder but with a tilted screen.. as not all cameras have viewfinders even in this day and age, then there's a problem with the reviewer. not to mention that their use of ACR is totally messed up. "No geometrical, sharpness or major noise-reduction adjustments were made." no sharpness is a bit weird. How exactly does one go about shooting at 30mm, 35mm and 55mm with an 11-22mm lens? Wrong lens was listed by mistake. The exif has since been corrected. All the shots taken by M owners in the Canon M forum are great. I don't know who took these photos, but dpreview needs to get someone who is at least trying to take a decent image to take these shots. Why are you giving such bad examples? The photos aren't bad, but they do lay bare uncomfortable facts about the inner lives of the photographers...which can seem like a bad thing. Notice how one set is all shot from slightly too far away or show backs only, and how many of the people are trapped awkwardly in the dead center of the frame? There's even one photo of a subject against a crooked horizon with his hands up in prayer as if saying "please, don't shoot." It doesn't take Freud to see photographer 1 fears intimacy and worries that people don't love him for who he is. So he uses the camera to "capture" them. Photographer 2 seems less troubled, he is a bit of a clown—but so was John Wayne Gacy, and you know what they say about the tears of a clown. Like photographer 1, he desperately wants people to love him...so he uses vivid colors and eye-catching compositions as the bait to lure viewers into his emotional snare. Not good or bad...just two guys trying to find meaning on this lonely rock we call home. 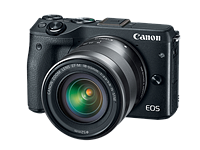 Opinion: Does the arrival of the EOS M3 mean Canon is finally taking mirrorless seriously?